London: British street artist Banksy has stunned the art world with arguably his most audacious prank yet, self-destructing one of his best-known works moments after it fetched more than a million pounds at auction in London. “Girl with Balloon" had just sold at Sotheby’s Friday for $1.4 million—a joint record for the maverick artist—when it unexpectedly passed through a shredder hidden in the frame. Banksy posted a video Saturday on his Instagram page accompanied by a quote attributed to Pablo Picasso—“the urge to destroy is also a creative urge"—showing the stunt unfolding and how he pulled it off. “A few years ago I secretly built a shredder into a painting, in case it was ever put up for auction," read captions displayed over footage of a man crafting the device into a faux-gilt frame. The video later shows scenes from Sotheby’s, where onlookers are left aghast as an alarm sounds and most of the image drops down through the frame and is left shredded. 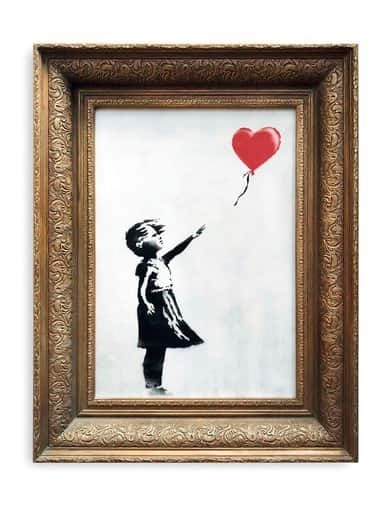 “It appears we just got Banksy-ed," said Alex Branczik, Sotheby’s head of contemporary art for Europe, in a press release. “The unexpected incident became instant art world folklore and certainly marks the first time in auction history that a work of art automatically shredded itself after coming under the hammer," the auctioneers added in the statement. Earlier Saturday, Banksy had posted a photo of the shredded work with a caption, imitating an auctioneer, that read: “going, going, gone". Sotheby’s, which could not be reached for further comment on Saturday, did not disclose if it had prior knowledge of the stunt. Branczik said he was “not in on the ruse", according to The Art Newspaper. “We are busy figuring out what this means in an auction context," he reportedly added. “The shredding is now part of the integral art work." Sotheby’s did not release details on the buyer, but reports said the winning bid was made by telephone. “We have talked with the successful purchaser who was surprised by the story," the auctioneers said in a statement to The Financial Times. “We are in discussion about next steps." His “Happy Choppers" from 2006 fetched $735,000 also on Friday at a New York auction of personal effects owned by the late actor Robin Williams and his wife. The price paid in London Friday evening for “Girl with Balloon" matched the artist’s previous record at a 2008 auction for another work, Sotheby’s said. The spray paint and acrylic work on canvas and mounted on board -- which was created in 2006 after first appearing as a mural in East London—depicted a girl reaching out toward a bright red, heart-shaped balloon. Mehdi Ben Cheikh, a Parisian street art specialist, said the stunt was “in the same vein as his performance in New York, which questions and criticises the limits of the art market." Banksy in 2013 set up a stand near the city’s Central Park and sold 20 signed canvases of his own work for $60 each.